Peter Ilsted was one of the most famous Danish artists on the beginning of the 20th century. Next to Carl Holsoe and Vilhelm Hammershøi (his brother-in-law), they established what later on was known as the Copenhagen Interior School. Basically, the name of the school is self-explanatory: the painters portrayed scenes of everyday life in the interior of houses. But not any scene. When you look at the work of Ilsted, Hammershøi and Holsoe, you cannot avoid feelilng calm. Their quiet rooms, delicate lighten by sunshine and, generally, unoccupied or occupied by just one person doing something, are key to understand the work of these artists. To achieve this effect, they restrained themselves from using bright colors, preferring a limited palette with dull tones. More so, they gave extreme importance on how sunshine reflected in each surface, giving us the sensation of different textures. In the work Interior by Ilsted, we see a young girl with her back to us with a vase in her hands which, I’m guessing, she is about to store in the sideboard at the back. Sunshine enters the room through the window at the left and allows an interesting and extremely well achieved play of lights and shadows inside the room. As I said before, we can almost touch the different textures: from the softness and thinness of the tablecloth; passing through the roughness of the wall; to the softness of the painted wood of the sideboard. 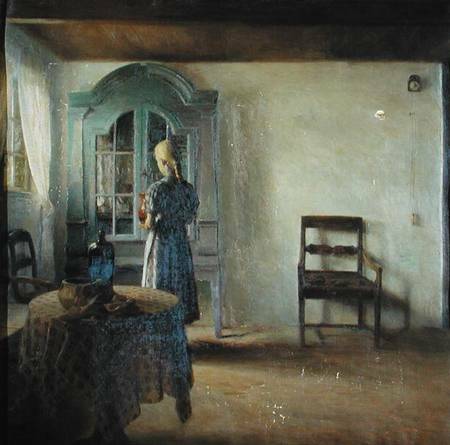 However, what I like the most in the painting is the shadow of the chair that reflects in the wall and the floor differently. The density of the seat makes the shadow to look more compact. On the contrary, with the back, legs and arm supports, the shadow looks more translucent. ~ by Álvaro Mazzino on July 21, 2010. All the way back in 2012—an eternity ago, in smartphone years—it was building beautiful phones while everyone else was still shipping boring black slabs. The One X, the One, and the One (M8) all stood as paragons of smartphone design. This entry was posted on July 21, 2010 at 16:22 and is filed under Uncategorized.You can follow any responses to this entry through the RSS 2.0 feed.You can leave a response, or trackback from your own site.